Digital marketing or online marketing is indeed an exciting tool for expanding your business. It has proved invaluable for small to medium business enterprises regardless of the products or services that are on offer. You do not really have to worry if you have shunned this online strategy so far. There is no time like the present, so gear up and get started. No, you do not actually require an entire team or to add an additional department on the lines of a successful digital marketing company. Just outsourcing your needs or taking timely advice from a reputed digital marketing consultant will do. Well, if you are still undecided about employing the techniques of online marketing, feel free to check out the reasons below to learn why this form of marketing works today. Surely your SME business has evolved over time, so why then be hesitant to embrace newer marketing tactics? Click here to get a free consultation from our Marketing experts! Being a small business owner does not mean that you should have limited marketing requirements. With online sales comes the potential to beat your competitors fair and square. Simply hire a digital marketing agency and see your traffic rise like never before. You can get a range of services like SEO, ASO, PPC, SEM, SMM, SMO and web marketing under a single umbrella to improve the online presence of your business. You certainly have the capability to compete with giant corporations via internet marketing. Social media services, such as Facebook, LinkedIn, YouTube, and Instagram have millions of active users who interact with others, shop, and follow brands. Using this form of marketing will help you reach out to your clients 24X7 even as you convert the leads into a loyal customer base. Online marketing services include utilising emails and social media for marketing. You can certainly increase your revenue with no cost or at very little cost when you add properly optimised content to your website. Delivering your products and giving your viewers exactly what they want in real time is indispensable for building your business reputation. You will succeed in building your brand reputation, and customer engagement will be satisfactory. You will be rewarded with more conversions, customer loyalty and brand recognition, all of which would have been a pipe dream before employing a digital marketing consultant for your company. Once you opt for digital marketing services, you will be pleasantly surprised to expand your reach and remain in touch with your viewers wherever they happen to be physically. Remember that the tech-savvy population is seldom without a mobile phone, and with your website available on mobile devices, you can target and convince people to purchase your products or services. You can enjoy greater interaction with your customers and give them exactly what they want by using these techniques. This will result in more satisfied customers who get personalised services. The rate of retention also increases substantially and you will have the opportunity to cross sell your products and even up sell to select customers. By effective utilisation of digital marketing services, any company can reach its target audiences within a short period of time. Statistics reveal that most SMEs have at least 3.3 times the chance of expanding their businesses via online marketing tools as opposed to conventional ones. Revenues increase greatly as well and with very little investment involved, the profits also go up tremendously. The digital marketing firm you have entrusted with online marketing will be able to provide a steady flow of targeted traffic to your website continuously, thus allowing you to convert your leads with minimum effort. This, in turn, will help you to get a good return on your investments. Courtesy of YouStory for this article. Mobile app development has become the most crucial task, which has a direct impact on setting up of different companies as a startup, and also regarding their marketing and popularity. Of course, nobody wants an insipid and monotonous app which is identical to other apps in the market. Here I am going to present the voyage mobile app developer goes through. In the current scenario, as a technical or nontechnical startup founder, if you are thinking about developing a mobile application think again! According to a report from WMC forum, just in October 2012, there were 43813 new apps launched in iOS app store alone i.e. 1400 new apps per day. Can you imagine where those numbers could reach if you include Android app store as well in 2016? But many of them were completely fiasco. Developing a mobile app is a herculean task. Even to reach the app store you have to cross so many hurdles. Get in touch with our mobile experts here to get a FREE consultation! Here are some unfeasible challenges faced by mobile app developer as a startup founder. The fundamental aim of developing an app is to make life simple, productive and pleasant. Keeping it in mind, creating an app which gets noticed is a grueling task. There are a way more good apps than there are successful ones, and that’s because many of the good ones don’t get investment. App discovery is extremely concerned with who are your users, what type of service they are expecting, their financial background and many others factors. Make sure while choosing developer team, it must be chosen gingerly. Deciding development approach will decide framework & mock-ups, UI & UX and many other imperative entities that mobile app is made of. So user interaction is a total concern with choosing right development approach. Once you have decided the development approach, to develop your app in real, it requires ample amount of money (to hire the developers in case of you don’t belong to programming background). There is no one-time investment as after completion of development, to bring a new variety of features and for Iteration, adequate amount of money is necessary. Our world is seemingly teeming with high-tech mobile brands. Challenges you might face are inevitable i.e. screen resolution, OS requirements, RAM and other factors and whether your app works on a smartphone or specific tablet or phablet. The main issue is choosing OS (either Android or iOS). For different OS you have to go for different SDK (software development kit), UI & UX, framework & Mock-ups and different iteration processes. Your app should run on a latest available version of particular OS as well as on an older version of similar OS. The empirical solution is to develop an app for each different platform available if you have enough investment. My personal opinion in the case of selection of OS goes for iOS, though both OS have their pros and cons. Parameters such as an app design, UI, user interaction are important, but the main factors you should not forget are Performance & battery consumption. If you can develop a good performing, bug-free app which runs on minimum power, this challenge can be overcome. Developer team has to be specific about choosing right development tool (such as SDK) and be precise about device specifications as well. Once you developed an app, you need to launch it into the app market, where as I mentioned before the gargantuan figure of apps are launched every day. As a startup, the biggest challenge is to stand out from the rest while creating an app. Even popular apps and games developers are struggling hard to make their mark. ASO stands for App Store Optimization, is a process of optimizing mobile apps to rank higher in the search result. Just like SEO (search engine optimization for articles, images, and video content) is for websites, ASO works for mobile apps. Better your ASO, the more likely your app will reach thousands of devices. This is a most fastidious challenge that people have forgotten about. It also includes an imperative component of ‘App store rating’ & ‘App store ranking’. Last but not least, as a startup, you should have precise knowledge about marketing and empirical way of promoting your app. It includes PR & media plan, social & viral marketing & internationalization of app which mean the development of an app that enables easy localization for targeted audience, regions, and language. You can put an app on the market in a weird but attractive manner that attracts consumers. There are several challenges that you will face: a crowded market, the same service provider as you, investment for promoting an app and others. To simplify marketing for you there are numerous tools like AppTamin, AppScend, MobileDevHQ, and Some other you should know about. There are many other challenges like debugging, beta testing, prototype simulation & distribution of app to make it available in different languages. An auspicious app is about 90% marketing and 10% development (yeah you read it right 90%) but that does not mean development isn’t important. As a startup, developing a mobile app can be grueling yet fantastic at the same time. Before you process for development it will be a great precaution to take a look in the market,and decide the factors that affected most during that particular period of time. Search for apps that are similar to yours read about them, whether they succeeded or failed. The combination of marketing, perfect time of the revealing product, development of most interactive app (quality product) & great development team can lead you to the doors of success. Get in touch with us for your Advertising Campaigns here ! The mobile advertising opportunity for brands is phenomenal, but brands are still under-spending on the format. Mark Rosner, Chief Revenue Officer at AppLovin, offers a guide to help marketers make sense of the hottest mobile ad formats today. The mobile advertising opportunity for brands is phenomenal – last year alone online ad revenues generated a staggering $60 billion, a whole 20 percent increase on 2014. 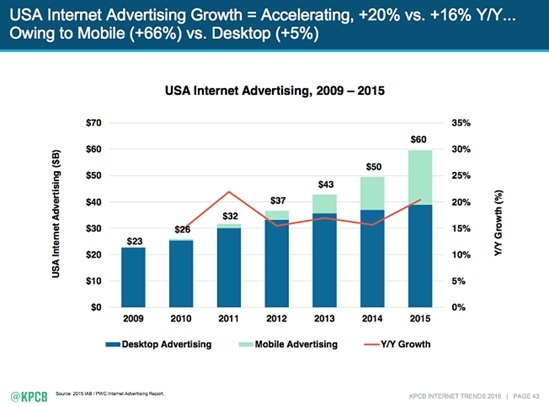 Mobile ad revenue grew by more than 66 percent whilst desktop advertising increased by only five percent. Despite this booming opportunity, research clearly shows that brands are critically under-spending on mobile relative to how much time users are spending on mobile devices like smartphones and tablets. Digital video ads empower advertisers to build stronger connections along the route to purchasing on mobile, with highly targeted content across many digital channels and different devices like smartphones and tablets. Video ads tend to offer better lifetime values than competing formats because they qualify users before they reach the advertiser and deliver rich, visual experiences. Video ads are good vehicles for many types of brands including upcoming movies, food, music, retail products and, of course, games. This inventive format is an advert that is a game that people can actually play. Increasingly considered as a new and effective route to mobile app discovery via gaming demos, playable ads provide a great way for consumers to sample content before installing an app. You can really engage audiences like casual gamers (or anyone else for that matter) with playable content. These ads blur the boundary between apps and ads, offering rich experiences where consumers can spend more valuable minutes interacting with ads. Whilst being fun in the moment, playable ads also deliver key benefits for marketers. Firstly, playable ads typically deliver better conversion rates – because they’re interactive they convert much faster than normal ads. Playable ads also offer better lifetime values. They cleverly qualify consumers before they reach the advertiser as they offer deeper experiences; these users engage at an increased rate than those received from other ad channels like native and display. In an age of diminishing attention spans, interstitials are a potent way to grab the complete attention of users, thereby increasing engagement, click-through and conversions. They also don’t take as much time and engagement as video or playable ads and for certain areas in an app, a faster ad experience can be better. There are downsides though: As interstitials often force users to stare at them until they’re allowed to click out, lots of users find this quite irritating if shown at an inopportune time. Great care should be taken to display interstitials only in a proper context like between levels on a game, at natural breaks in the app, or at the end of a session or specific app function. Native advertising is paid content which matches the app’s “native” format, hence delivering a less interruptive experience for users. Native ads have the same design elements, copy layout, UI and buttons as the app. Mobile marketers need the following six ingredients to deliver native mobile ads: URL, thumbnail, headline, description, brand logo and brand name. By delivering ads that appear to be in the same format as the publisher or outlet, they’ve proven to be effective at generating higher click rates than traditional mobile ads. Native ads are extremely popular with brands: Chiefly because click-through rates are often much higher when compared to traditional ads, plus engagement is much greater. However, there is a danger that some consumers could feel native mobile ads are misleading, damaging both the reputation of the publisher and the brand. To avoid this, publishers should always conform withMMA guidelines for native ads. For mobile marketers to succeed it is vitally important they understand their user tastes and preferences and create marketing strategies around them. There isn’t just one ‘best’ mobile ad format for all – the choice of format deployed depends on a number of variable factors such as the game or app in question, the context, where the ad is placed and the frequency of placements. With the proliferation of mobile devices, with smartphones in particular being the preferred device for consumers, it is essential that organisations deploy the right ad format strategy to leverage mobile platforms to help further drive revenues. The following is a guest contributed post from Jonah A. Berger, VP/Director, Performance Content, Performics Worldwide. When I’m asked about app store optimization (ASO), a quote from Dr. Emmett Brown in the film “Back to the Future” comes to mind:“Roads? Where we’re going we don’t need roads.” Everyone’s heard about app store optimization. Well, everyone except Doc Brown, because in 1985 the mobile web and apps didn’t exist. Thirty-one years later our still-necessary roads are the mobile web and ASO is where the flying DeLorean is headed faster than 88 miles per hour. But this doesn’t mean you need to slam your lead foot on the gas when it comes to setting ASO in motion. ASO is about optimizing an app for visibility in stores like Apple’s App Store and Google Play. It’s SEO for app stores and is sizzling hot right now for brands and performance marketers. By 2017, mobile users are expected to spend an estimated three hours and 23 minutes daily in-app versus only 52 minutes on the mobile web (eMarketer, 2015). That’s nearly three times more time spent peering at app content without a hint of a mobile web URL, browser or Google query being typed by impatient fingers. And let’s not forget that Apple and Google in the last year unveiled app-install ads in their platforms to take advantage of our hunger for apps, and the competitive environment in which they’re found. As more mobile users rely on apps as conduits to all-things mobile content, brands and performance marketers will need to sit down, take a breath and talk it over. Content works best when you create it for your intended audience and answer its needs at the right place and time. Before you optimize your app for stores, study your website analytics to learn who your visitors are, what interests them and even the keywords for which they searched. (One way to do this is by activating “Site Search” in analytics.) What about top converting products? Most highly trafficked pages? The more data you crunch, the better the app you present to your audience. The available tools for keyword research and the app market are far from perfect and a little “wet behind the ears,” but to understand how people search for apps check out Google Keyword Planner, Mobile Action, Sensor Tower, SearchMan and App Annie. Play around with each – especially Keyword Planner – to learn which suits you best. Chances are you’re not ranking in the top spot for all the keywords related to your app. To know the competition can only be beneficial, so search the app stores for your target keywords to see who’s most visible and then try to explore why. Do they have better app content? Maybe a hip title and description? What about the icon they used? Images? Videos? How are they promoting the app on their website? In social media? How many reviews and ratings do they have? Once you understand what competitors are doing, use it to your advantage by enhancing your current efforts. Think differently and differentiate as necessary. This is probably the most important point. Why? Because owned assets are totally in your control. Just like a title tag in SEO, it’s your call as to which keywords are used and how elements are structured. In order to make the most of owned assets in app stores, you must ensure that target keywords are included in the Title, Keywords (Apple feature only – more on this in a bit), Description, Icon, Screen Shots and Videos. Title: A maximum of 255 characters, with truncation after 23. Keywords: A maximum of 100 characters. Description: Optimize at least the first three lines. Screen shots: Upload a maximum of five, with priority placed on the first two. Videos: You can upload a maximum 30-second promo. Title: Truncated after 30 characters. Keywords: No keyword field so optimize the description (see below). Description: A maximum of 4,000 characters, but focus on optimizing the first 167. Screen shots: Upload a maximum of eight, with priority placed on the first two. Videos: You can upload a maximum 2-minute promo via YouTube (Big G owns it after all!). Taking content from your website and distributing to the masses that frequent your slew of touchpoints is important. This promotion can happen at the local, regional or global level depending on your target audience and goals. Google Play optimization comes with an obvious advantage over Apple App Store since it’s a platform owned by the world’s leading search engine. But you should take advantage of building links to and extending outreach efforts for not just apps that reside in Google, but for Apple as well, whenever applicable. Don’t ever sell any of your assets short, and don’t forget to promote them on social media properties to bloggers and influencers with whom you’ve developed relationships. Any website that can help spread the good word about your app is beneficial to your overall success. As you realize more and more app visibility across touchpoints near and far, and note an increase in downloads, ratings and reviews will likely follow.